The construction of up to 20 new ferries for New York City is arguably the most exciting maritime new construction project in the U.S. this year. Last month we visited with Cameron Clark, Corporate Vice President, Development and Special Projects, Hornblower, the project manager for the new Citywide Ferry by Hornblower fleet, who discussed the challenges and opportunities ahead. Hornblower has, in the span of 36 years, become the force in the U.S. ferry market, with more than 2,000 employees and 20 million passenger trips annually, including a cumulative staff of 700 in the New York City area. 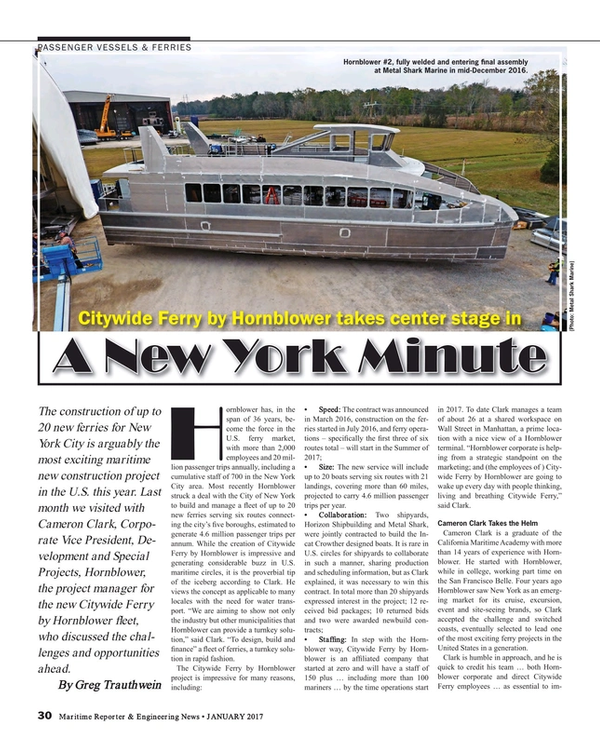 Most recently Hornblower struck a deal with the City of New York to build and manage a fleet of up to 20 new ferries serving six routes connecting the city’s five boroughs, estimated to generate 4.6 million passenger trips per annum. While the creation of Citywide Ferry by Hornblower is impressive and generating considerable buzz in U.S. maritime circles, it is the proverbial tip of the iceberg according to Clark. He views the concept as applicable to many locales with the need for water transport. “We are aiming to show not only the industry but other municipalities that Hornblower can provide a turnkey solution,” said Clark. “To design, build and finance” a fleet of ferries, a turnkey solution in rapid fashion. Size: The new service will include up to 20 boats serving six routes with 21 landings, covering more than 60 miles, projected to carry 4.6 million passenger trips per year. Staffing: In step with the Hornblower way, Citywide Ferry by Hornblower is an affiliated company that started at zero and will have a staff of 150 plus … including more than 100 mariners … by the time operations start in 2017. To date Clark manages a team of about 26 at a shared workspace on Wall Street in Manhattan, a prime location with a nice view of a Hornblower terminal. “Hornblower corporate is helping from a strategic standpoint on the marketing; and (the employees of ) Citywide Ferry by Hornblower are going to wake up every day with people thinking, living and breathing Citywide Ferry,” said Clark. Cameron Clark is a graduate of the California Maritime Academy with more than 14 years of experience with Hornblower. He started with Hornblower, while in college, working part time on the San Francisco Belle. Four years ago Hornblower saw New York as an emerging market for its cruise, excursion, event and site-seeing brands, so Clark accepted the challenge and switched coasts, eventually selected to lead one of the most exciting ferry projects in the United States in a generation. Similarly, Clark is open to looking outside of the maritime box when selecting the best talent for the project, noting that the new company’s ‘head of customer success’ came from JetBlue. With a budget of $80 million for the boats and a mandate to deliver up to 20 ferries in less than two years, from the outset the project required an innovative mindset. Perhaps nothing better embodies this than the decision to employ two shipyards to construct the new fleet. The tight timeline to deliver ferry service to the five boroughs of New York was the primary driver for the selection of two shipyards to fulfill the contract. The contract was announced in March 2016, vessel construction commencing in July 2016, and first ferry service scheduled to begin in the summer of 2017. The two yards are building identical Incat Crowther designed, 26-meter, 149-passenger aluminum high-speed ferries, though it was not announced exactly how many boats each yard will build. By late autumn 2016 both yards were busy building the hulls totally under cover and expanding local workspaces to make sure that remained the case. Horizon, which has expanded its facilities and production capabilities in recent years, will build the ferries using an assembly-line type roll-out with the first boat ready for delivery in the first quarter of 2017. Metal Shark’s newbuild program is also full steam ahead. In advance of the contract award, Metal Shark won a MARAD grant and will complete a 150 x 80-ft. auxiliary structure for final assembly, which was partially funded by the MARAD grant. A new 160-ton Marine Lift transporter arrives in January and will significantly facilitate the movement of boats around the yard and to the water for launch. A project of this magnitude, particularly one involving a major municipality, is sure to generate much attention, and Citywide Ferry by Hornblower has been planning to ensure the boats and operations are delivered above expectation. In particular, energy efficiency and the environment has been a mantra from the outset. Clark said that the efficiency focus started in the initial design phase, and “A lot of energy was put into hull form. We wanted a vessel with the best wake/wash performance of any hull in New York harbor,” helping on everything from fuel consumption to the reduction of shoreline erosion. The challenges to this project are not relegated to the vessels alone. “The way that it is the same? We are creating a platform for amazing experiences that go beyond transportation services. Something that Hornblower tries to bring to every start up, with every journey, is to ensure that the passenger comes away with the feeling that they have been cared for,” said Stagner. While Clark acknowledges the challenges, he neatly summarizes how his company is able to fulfill efficiently. Starting Summer 2017, Citywide Ferry by Hornblower will provide a new affordable way to travel between waterfront communities throughout New York City. When Citywide Ferry by Hornblower becomes fully operational in 2018, the six routes will carry an estimated 4.6 million passenger trips per year. The Rockaway Route of the Citywide Ferry will provide a key transit link between the Rockaways, Sunset Park, and Lower Manhattan, while connecting New Yorkers to our city’s beaches. The Astoria Route of the Citywide Ferry will connect the growing residential and business communities of Western Queens; Roosevelt Island, including the new Cornell Tech campus; and residents and job centers in Midtown and the Financial District. The South Brooklyn Route of the Citywide Ferry will connect South Brooklyn’s residential communities, waterfront parks, and innovative industries to residents and job centers in Midtown and the Financial District. The North Brooklyn Route (Formerly known as East River Ferry) features frequent, reliable service that connects Manhattan with various destinations in Brooklyn, Queens and seasonally on Governor’s Island. The Lower East Side Route of the Citywide Ferry will connect residents with job centers in Midtown, the Financial District, and Long Island City. The Soundview Route of the Citywide Ferry will connect communities in the Bronx and the Upper East Side with job centers in Lower Manhattan. Dimensions	90 x 35 ft.